Why show pieces when you have the whole puzzle? The great thing about shopping online is that I can search for and find almost anything when I know what I’m looking for. And that’s great, but when I don’t really know what I’m looking for, what happens then? I could find a range of products that should be ok, but really, I’m not sure. In eCommerce, we're all too aware of the very tangible connection between ‘Not sure’ and ‘Cart abandoned’! Even in the best-case scenario, an absence of customer certainty will cause increasing pressure to discount products in order to sway decisions. Neither of these circumstances seem ideal. So what can we do? Customer uncertainty can grow from a multitude of factors including appeal, brand/product confidence, finding/understanding relevant information, and so forth. The approach we take for each factor will be different and appropriate for each industry and customer type. Today we are going to take a closer look at the whole puzzle approach. From a customer's perspective, am I looking for one item, or do I have a greater need? If I have a whole puzzle to create, then I’m going to appreciate someone assembling the pieces together for me, and that will make me feel more confident in making a purchase. If we can anticipate a greater need, we can often turn this decision-making obstacle into an opportunity by facilitating a more complete solution. A more complete solution could also lead toward up-sell and cross-sell possibilities so there is a lot to consider. As is so often the case when considering functionality changes, the first step should be to understand the needs and behaviour of your customers. Only then can you provide the options that will assist them with easier decision-making. Business: Sells homewares to Hotels and Restaurants. Customer Persona: I’m a restaurant manager/owner looking for a refresh, I don’t just need glasses, plates, etc. I need cohesive ideas to create a complete new look. I’m not an interior designer so some good styling advice would really help! Showing multiple scenes with complete and styled place settings would be hugely powerful in helping me to visualise the options that could be achieved within my restaurant. I’ve tried the painful process of making up my own settings and they don’t really seem to come together or create the look I’m aiming for. Understanding each scene type will further add to my decision-making confidence and possibly sow some seeds around creating additional looks in the future for changing seasons, events, etc. Ideal for weddings or restaurants looking to create a subtle romantic theme. Create style variations with different colour options. Help me with your industry and product knowledge. What would be an important consideration for me, perhaps a question I may be forgetting to ask? Don’t make the mistake of assuming that even qualified or experienced customers know what you know. All of the tableware in this collection is tough enough for restaurant usage and suitable for commercial dishwashers. This collection will be available until ‘x date’ to ensure that you are able to order matching replacements/extras if required. Ok I’m sold but, I could still change my mind? Right now I am sure that the theme I've chosen will work for me. My decision has been swayed by the ease of finding all the pieces I need to create a new look with confidence. 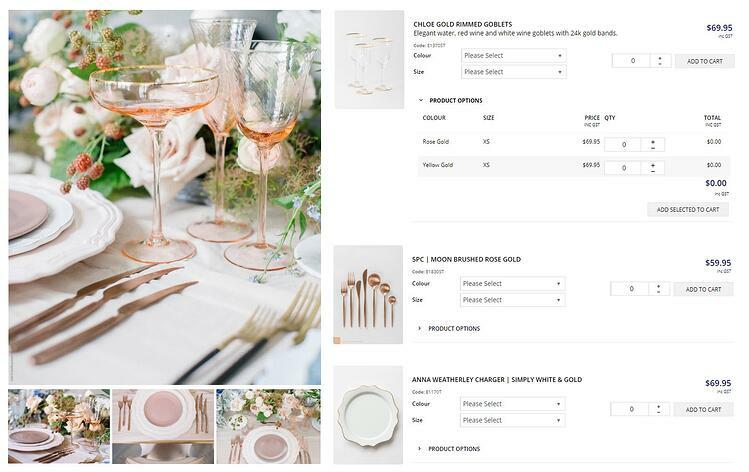 It could be difficult to achieve this on other websites so I’ve saved countless hours of floundering and possible heartache from trying to mix and match my own place settings. That’s a great bonus for me so I’m not going to spend too much time trying to price match individual items. How easy is it to order my new theme? There are many ways to skin this cat depending on your specific industry, your data, and the requirements of your customers. To continue with our current example of restaurant owner/manager, we could make the products available next to the scene image. The products can be listed just as in any search screen showing or hiding the information that you feel to be appropriate, and also break out variants where applicable (as per the image above). I've made my choice and I’ve ordered enough complete place settings to refresh my restaurant. I've also made a note to check the themes again in a few months. I’d like to consider using seasonal place setting themes as a way of keeping my restaurant fresh. What’s involved in creating whole puzzle functionality for your site? Understanding your customer should always be the first step. There is a lot you can achieve by creating richer content to reduce or remove the ‘Not sure’ experience from a customer journey. There are also many functional options that can be customised by either yourself or by Commerce Vision to create a more holistic path to purchasing. We are happy to discuss options with you so that you can create better experiences for your customers. If you’d like to know more, let's catch up!